Featuring 70 then-and-now full-color photographs and heartwarming tales of unforgettable memories about love, friendship and family, this book is a gift everyone will enjoy. "Young Me, Now Me" by Ze Frank is an absolutely fun book to review. This little book is jam packed with photographs. What makes this book so different from others is that there are two photos on opposite pages taken of the same person, or persons, when they were kids and when they were older. 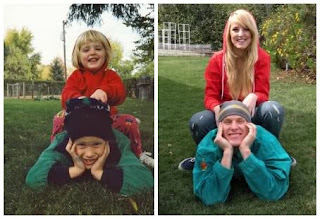 What makes it unique is that each older photo is geared to look exactly like the "kid" picture-------clothes, scenery, background, etc. Well, as close as humanly possible. This book would be ideal for ideas for scrapbooking, then and now for a Christmas card, a photo frame, etc. Ze Frank's identical photos spanning decades is a delightful book. I would strongly recommend it for a gift for those who love photography or scrapbooking. We are also giving away one of these copies of this book to one lucky reader from Canada or the USA. A random draw will be made by Random.org on December 19, 2011 from all entries received. Tell me have you ever taken a photo in one year or someone else took that photo, only to retake that same photo in the same spot, years later? I've never retaken a picture but it's a neat idea.